A wonderful tasting Italian bread usually baked at Christmas. It is loaded with dry fruits and/or candied fruits and is beautiful when sliced. Pannetone bread can be served in so many ways. It can served with a big scoop of gelato, or with a butter cream icing. It makes the best bread pudding I have ever tasted. 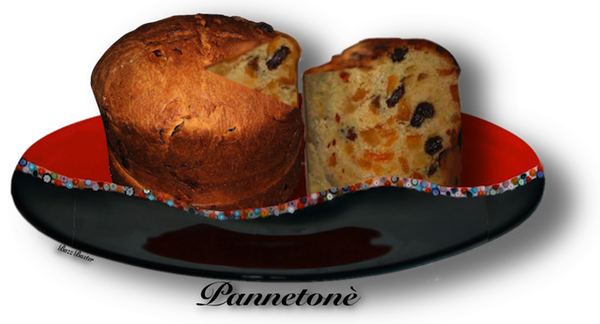 And please.... it is not a fruitcake. You can use raisins, dried figs, candied lemon or orange zest. I personally like the dried fruit not mixed with the candied fruit, and vice-versa. But, this is a personal choice and you are going to be pleased with the results no matter what you do. And oh...Pannetone makes the best Pain Perdue or French toast. experiment with the baking time--it may take longer. over night. Stir occasionally if possible. sticky, adding more flour if necessary, about 3 minutes. (74º-80º F) draft-free place until doubled in volume. and knead briefly. Shape into a log. draft-free place until the dough rises nearly to the rim of the pan. homemade hearth or baking stone on the center rack of the oven to 400º F. Bake 20 minutes. melted butter. Cool on a wire rack 20 minutes. Unmold and cool completely before serving. Makes 1 round 10-inch loaf. Italians do this for the Holidays and not as a steady,  everyday treat.